for a total of $625.96 per machine. Because I have a structured wiring system in my apartment I didn’t bother with the wifi card. Assembly was fast, taking ten or fifteen minutes to open the bottom cover, snap in the RAM and the SSD, and button the machine up again. Download the Ubuntu image from the Ubuntu site. This then booted on the NUC, and the install went relatively smoothly. Did a little searching around and learned that I needed to update the BIOS on the NUC. Downloaded the updated firmware from the Intel site, following a YouTube video from Intel, and applied the new firmware. Redid the install, which ultimately worked, after one more glitch. The second machine went more smoothly. Two little Linux boxes now working quite nicely – completely silent, 16G of RAM on each, 240G SSD on each. They are physically tiny … hard to overemphasize how tiny, but really tiny. They sit on top of my Airport Extreme access point and make it look big. Reblogged this on The Reader Voice. So what was the purpose of the exercise? I mean what do you use them for? Can you link to the YouTube video which shows the firmware update? I tried installing Windows 7 from a boot stick but got a blues-screen complaining about the device not being ACPI compatible. I had to adjust the BIOS to choose both legacy and UEFI options on boot but as my preferred OS had to choose Win 7 over Win 8 I’m sure a lot of people get this issue? Well, as an old UNIX geek I wanted to have some systems to play on. I wanted to have “enough” that I could keep my sysadmin-at-scale chops going. We now have a total of five machines – our original Dell machine running Ubuntu 12.04 plus four of these little NUC machines. In addition, my son has been doing some WordPress consulting (and I do some pro-bono web work as well) and I wanted some Dev servers that we could play on without exposing our screwups to the cold hard Internet. Beyond that, in RL I run infrastructure for a midsize firm and I like to keep my hand in so that when people make assertions that I don’t believe I have a way to independently verify technical reality. And I wanted to run DNS and DHCP on my home network so that I could stop referring to the printer in the kitchen as 10.0.0.200 and instead call it simply kitchen. The YouTube video was linked from the Intel site. The page on which I found the YouTube video is: http://www.intel.com/support/motherboards/desktop/sb/CS-034499.htm. 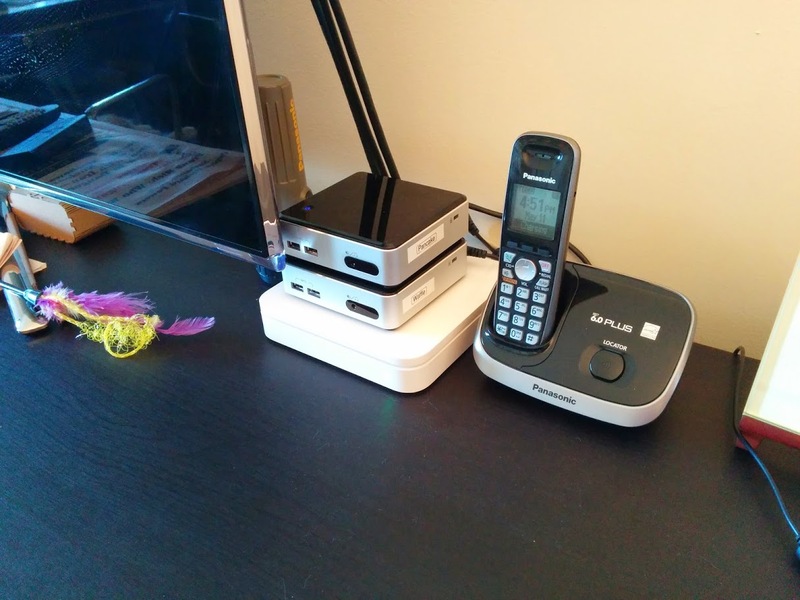 Do you think these small boxes (Intel NUCs) are powerful enough as LTSP servers (Ubuntu)? Can they power 4~5 thin clients for light development work? I have a bunch of HP T5740s and initially thought Mac Mini maxed out should do but more driver issues and expensive. – A geek at heart! I don’t know much about LTSP, but some casual Googling and reading suggests that each of my configurations is stronger than what at some folks are using to support 20 users. YMMV, of course. Hi, I’m a bit late to the game but I’m looking to use a NUC as a home server but I’ve read loads of pain about using them ‘headless’. It looks like you’re using (at least one of them) without a monitor. Is that the case? I’m using them *all* headless. I plug in a keyboard and mouse and use my HD TV via HDMI during initial setup. I added two more and got automatic install working (I will post about that) but BIOS update, which you need to do to boot Linux, still needs keyboard and display.